In the boom years, cities got very lazy with the assessment process, allowing the general widespread rising of property values to cover up their poor practices. Few have adjusted to the new reality. Now that the market has changed, a very clear statement from the legal system reaffirming that actual property values need to measurably increase would force a lot of cities into panic mode. We should be building strong towns. Thank you to everyone who emailed me or provided comment on our project narrative for a grant application that I posted last Friday. It was all very helpful. I'm optimistic that we'll get the grant and it will produce some great insights to share with you here. In the meantime, even if you are not a foundation or a philanthropist we can still use your help. A donation of any size goes right to supporting our modest month-to-month costs, support that we need to keep doing this blog, our podcast, SID.tv ad everything else we do. And if you are a foundation or a philanthropist (or know where there is one we should talk to), please get a hold of us. Thank you. The proposed assessment is for the general benefit of the city of Eagan and others who will use the project and therefore there is no special benefit to the Ecolab property. Eagan is one of the wealthier suburbs of the Minneapolis/St. Paul metropolitan area, meaning they are in the "illusion of prosperity" phase of the Suburban Ponzi Scheme. Their population is younger (median of 36.8) than the state average (43.1). The median household earns more ($74,960 compared to $55,616) and has a higher home value ($252,352 compared to $200,400) than other Minnesota cities. Eagan consistently shows up on "best places" lists. This year it was #14 on Money magazine's list of America's best small cities. In short, while there is a lot logistically going on in Eagan today that city officials would have to balance, a shortage of funds is currently not one of them. That makes the Ecolab challenge all the more interesting. Eagan officials have the capacity to take this as far as they want in our legal system. There is enough at stake financially where a settlement would seem difficult, especially if it created a local precedent. City officials may not want to open that door and potentially invite scores of challenges to its assessment approach as the next life cycle of road/street maintenance awaits them. Ecolab also has ample reason to fight the assessment, the strongest among them appearing to be that they are right, the assessment is not legal. That is what Ecolab is arguing, and they have a persuasive case. Attorney Roston lodged 10 objections to the assessment, including that the proposed assessments "constitute an unconstitutional taking of Ecolab property without just compensation" and that they "exceed any purported increase in value to Ecolab property." "The assessment formula used is not legal," the objections continue. "Other properties that should have been assessed were not assessed," and "the proposed assessments violate relevant provisions of the Eagan city codes," as well as "other Minnesota law and statutes." I was unable to locate the city's assessment policy online so I am not able to examine it myself. I am going to infer from the dispute, however, that it is a variation of the standard approach that attempts to collect money based on taking a percentage of the project costs and then charging each adjacent property owner based on how much frontage they have. The project definitely runs next to Ecolab's campus. City engineer John Gorder said the road improvement, which runs past Boulder Lakes Business Park, passes directly adjacent to Ecolab's property. He said that future development there would benefit from the improvements. And based on that insight -- that the project runs adjacent to the Ecolab site -- the city puts forth that Ecolab benefits from the improvement and, because they benefit, they can be assessed their share of the costs. To me, there are two notable things about this project. The first is this argument that Ecolab benefits from the improvement. 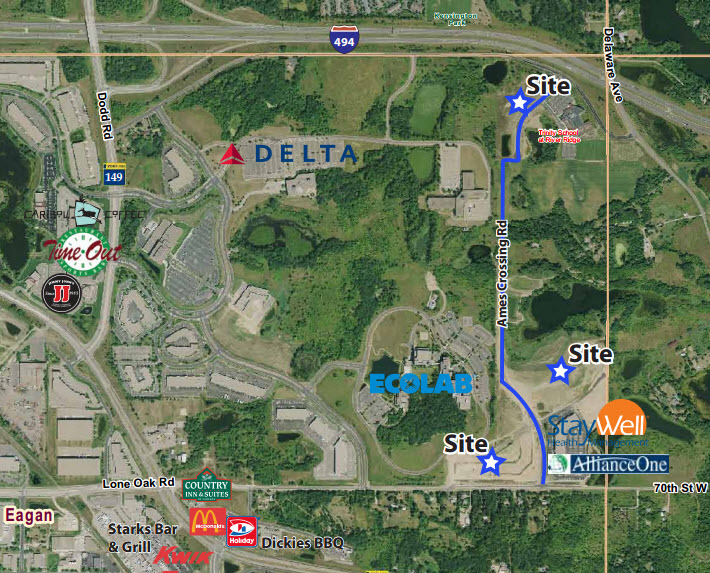 Here's where Ecolab sits in relation to the project, which is shown in blue on this marketing map. The Ames Crossing Road project lies directly East of the Ecolab site. A closer look at the Ecolab site reveals how little they actually benefit from the improvement of Ames Crossing. They have already constructed an elaborate entrance road on the west side of their property. Two enormous parking lots and a very expansive ring road have already been built, none of which rely on -- or would be enhanced by -- Ames Crossing. While it does appear that there is room for expansion on the Ecolab site, there is no reason to believe that such an expansion would generate traffic in excess of what could be handled by the overbuilt corridors already in place. 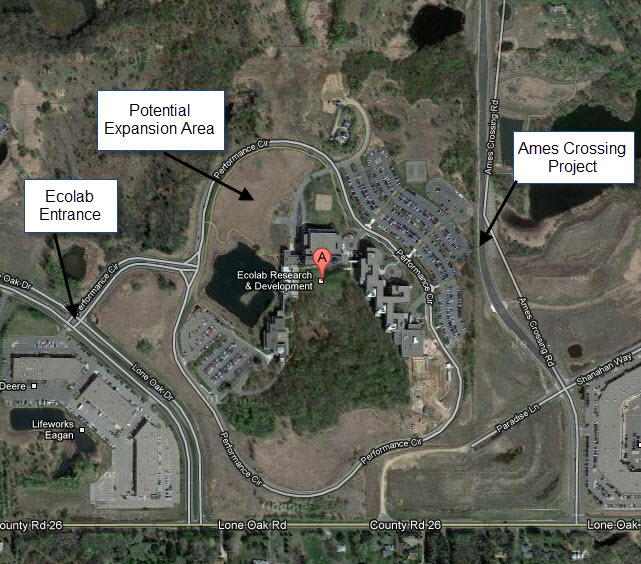 The Ecolab site in Eagan, MN. Photo taken from Google Earth.In short, it is not clear at all how Ecolab would benefit from the improvement of Ames Crossing. However, let us make sure we are all talking about the same thing when we use the word "benefit". In order for the assessment to be legal, the project must cause the Ecolab campus to increase in value an amount equal to or greater than the amount the city is trying to get them to pay. That's not just me saying that but Eagan City Attorney Michael Dougherty. If the issue goes to court, the focus of the case will be on whether the improvements had increased the value of Ecolab's property in an amount equal to the assessment, Dougherty said. Ecolab is being asked to pay $110,172. What potential future purchaser of the Ecolab property is going to increase their bid by $110,000 when they discover this fantastic new road running along the eastern boundary? I can't see any, and since $110,000 can buy you a lot of legal representation, this seems likely to be headed to court. By extending the "commercial industrial collector road" from O'Neill Road to Lone Oak Road, the city's stated goal was to provide access to current and future development as prescribed by the city's northeast-area traffic study. A future phase of the office park is going to require completion of the collector. In other words, new growth is creating the demand. Their comprehensive plan, which was adopted in 2010, shows a lot of potential for new growth in this area. From page 9-7 of the Eagan Comprehensive Plan. Blue dashed line was added to show the rough location of the project. The "E" was added to identify the Ecolab site. Can the new growth -- the new growth that is precipitating improvements to Ames Crossing -- not cover the cost of the project? Is the increase in value of the underutilized and vacant properties not increased by more than the project cost? If so, why not assess them the full amount? If not, if the cost of the road can't be justified by the properties it serves, how is it that the city proposes to sustain this project into the future, over multiple life cycles? Unfortunately, and this is all too predictable, Eagan is of two minds when it comes to economic development. On one side, they tout what they call the Eagan Advantage for Business, a long list of reasons why businesses would naturally want to locate in the city. This is an admirable list that will appeal to a certain segment of the growth market, albeit not one I would be chasing. I don't know the history of Eagan when it comes to subsidies -- maybe they never use them, although why feature them so prominently then -- but everything here seems consistent with the broken American growth equation. Accomplish projects that build new infrastructure. Attract businesses with said new infrastructure. Use additional subsidies where needed. Utilize the positive cash flow of new growth to keep taxes low and amenities high. When you step back and think about it, the really amazing thing about this project is the way the city has chosen the allure of new growth over their existing business. They have a perfectly good corporation in Ecolab, a business that cities across the state would subsidize themselves into bankruptcy just to have a chance to attract. Eagan's approach is typical though; instead of focusing on what would make their existing taxpayer more successful, what would allow them to grow and create more jobs and opportunity on their current site, they aggressively seek the next new thing. And when the priorities of existing business fail to align with the desires of that theoretical business we might someday attract -- or have the opportunity to pay to like our city best -- we seem to always choose that new growth. Pause and ask yourself why. It is very likely that Ecolab will settle for some lesser amount, that the city will ultimately capitulate on the "advice of their legal counsel" and there will be a settlement. That would be a shame. In its single-minded pursuit of growth, the city of Eagan is not only acting illegally, it is biting the hand that feeds it. That is the kind of thing that happens when you get caught up in a Ponzi scheme. Of course, I'm sure they don't see it that way. This project, and the accompanying assessment, is what is needed for the greater good. After all, Ecolab is a multi-billion dollar company -- certainly they have the money for this worthy project. Why would Ecolab be doing this to a city that is just trying to do the right thing? Where is their sense of community? If this goes to a decision by a court, it very likely will have a dramatic impact local government, at least here in Minnesota. In the boom years, cities got very lazy with the assessment process, allowing the general widespread rising of property values to cover up their poor practices. Few have adjusted to the new reality. Now that the market has changed, a very clear statement from the legal system reaffirming that actual property values need to measurably increase would force a lot of cities into panic mode. It is time to start building strong towns.